This post is an attempt to bring together a number of comments at the Isaac Brock Society. 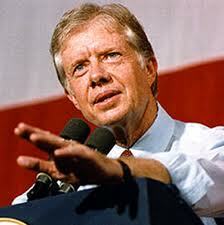 It is interesting to compare the Democratic Party of the Carter years to the Democratic Party of the Obama years. It appears to be “night” and “day”. It is important to note that President Carter does believe that the Obama administration is committing human rights abuses. It would be interesting to know what his opinion would be of the way in which the Obama democrats are treating U.S. citizens abroad. President Carter also opined that the United States can no longer speak with moral authority when it comes to human rights (a comment reinforced by Russian President Putin). “Americans working overseas are essential to a viable export program. An increase in the number of Americans assigned abroad can increase our exports, reduce the negative balance of payments, enhance our country’s image, and raise employment in the U.S. Unfortunately nothing concrete was done to implement this recognation and here we are 34 years later witha $750 billion trade deficit which translates into some 7.9 million destroyed American jobs producing for export, the human rights destroyed for persons with US citizenship living abroad who, because of FATCA cannot open or maintain bank accounts in the countries where the live, and record numbers renouncing their citizenship because they simply cannot survive unless they do so. To top it off in these days of fiscal crisis for the US the citizenship-based tax policy enshrined in US law which is, in my opinion, the prime cause of this massive trade deficit and its resulting unemployment produces only about $6 billion for the US Treasury while the trade deficit destroys some $136 billion in tax revenues. How can this possibly make any sense to anybody in Washington? 2. Law should not be designed so as to NOT create a competitive disadvantage for U.S. citizens abroad. This provision was clearly designed to operate prospectively. (Unbelievable what has happened since.) Think of FBAR, FATCA, the PFIC rules, etc, etc. The enclosed report, prepared in compliance with Section 611 of Public Law 95-426 identifies six Federal statutory and regulatory provisions which discriminate against United States citizens living abroad. The Executive branch has evaluated those provisions and has concluded that changes are warranted in order to resolve certain inequities involving citizenship and veterans and social security benefits. The report also reviews twenty-eight other issues raised by some Americans. living abroad concerning their rights and obligations as U.S. citizens. This report is the result of a painstaking and earnest review of the many legal provisions affecting our citizens residing abroad. The test for discrimination used was to compare the effect of those provisions on U.S. citizens residing abroad with U.S. citizens living in the United States. I believe the report responds in a responsible manner to the concern about the situation of Americans residing abroad. I am aware that section 407 of H.R. 3363 just recently enacted, broadens the scope of the report to include the “competitive disadvantage” of Americans abroad compared to nationals of other major trading partners and extends the report’s transmittal date until January 20, 1980. Because this report was completed and awaiting my transmittal at the time section 407 was enacted, I believe it best to transmit it now to the Congress for its consideration. I have, moreover, requested the Secretary of the Treasury to prepare an additional report on the taxation of American citizens living abroad compared to the treatment by our major trading partners of their citizens living abroad and to identify any competitive disadvantages that may ensue. The Administration will continue to work to resolve discriminatory provisions in regulations and in agency procedures affecting Americans living abroad; I am hopeful that inequities which are subject to legislative remedy will likewise be resolved. What Did The Carter Report Say? You can look at this report in entirety (which does not contain the more extensive supplementary report on taxation that is alluded to in the introduction, but not named – commissioned to look more specifically at details of taxation issues only), at the very end of this report, are very focussed and astute point-by-point rebuttals by ACA of the response or lack thereof from the government (addressed to the president specifically). There is a detailed section where the ACA specifically notes the discrimination against foreign non-resident spouses – and calls it ‘the marriage penalty’. In the ACA comments, they describe the US government rationale, which seems to be that by deliberate design, those filing ‘separately from abroad’ are to be penalized by having a much lower reporting and tax threshold than those filing as ‘single persons’ –deliberatelypunishing those who do not choose to subject their non-US non-resident spouse’s ‘foreign’ income and assets to eternal US taxation – which the US would like to force on them from afar, within the borders of all other countries, even in the absence of any other US relationship other than having married someone deemed to be a ‘US taxable person’. The rationale is that this is because we are presumed to beavoiding paying tax to the US on the assets and earnings of the non-US non-residentspouse, which we are presumed to enjoy via our ‘share’ of ‘community property’. Which of course is generated and located in another country, and already taxed by that other jurisdiction – where the true owner of the assets is a citizen. This is a form of double taxation by proxy. The ACA wonderfully skewers this US claim that the IRS should be able to extend US taxation assessment and powers to non-US, non-residents ‘abroad’, merely because they married a US person. At issue also is that if we do not file ‘married jointly’, that is a decision that the non-US person has the right to decide on their own behalf – they have no obligation to the US – so why should they agree to take that burden on? Thus, the US uses the US taxable person spouse as a lever to get at the earnings and assets of non-US citizens, who do not live in the US, have no US taxable status, no US taxable income, no US citizenship, no US residency, enjoy no US services – based and rationalized only on some specious and fantastical claim that by mere association with a US taxable person through marriage, the US has the right to tax even foreign nationals outside its borders. Worth reading through the entire text at that link. Looks like most issues still the same – which is depressing. Wonderful to see how powerfully and assertively the ACA came up with their detailed list of discriminations against US citizens living ‘abroad’ and how they dissected each non-response or irrational assertion by the US government as to why the discrimination was justified. Obviously a very dynamic organization right from the beginning. Fulltext of this report and associated material needs to be digested, and to obtain the more tax focused report (unnamed) that was also commissioned as an adjunct. You will see Joseph R. Biden on the list of members making up the Committee on Foreign Relations who received the report. This report – plus supplementary reports from the time, would make very sound basis for comparison – as a baseline to compare with the state of things now, and see whether the US has addressed the discrimination brought to their attention more than 30 years ago. There were some changes to citizenship laws – and interestingly one of the obstacles the US government identified to making retroactive changes to how citizenship was granted to children of US parentage born abroad, was a ‘ripple effect’ related to taxation (as well as Social Security, etc.). Was not able to cut and paste excerpts (though didn’t try screen captures) to provide actual quotes here. And interestingly, the ACA identified many issues specific to IRS policy and priorities; which you will all find entirely familiar from the TAS Reports to Congress : including; the failure of the IRS and US to provide toll-free telephone assistance to those abroad, the failure of the IRS to provide and mail requisite forms (including the FBAR! – which is described as an example of a less common form), the failure to allow for sufficient time for IRS correspondence to reach those abroad and for them to respond, the issue of foreign postmark dates re ‘timeliness’, the problem of being required to provide information to the IRS before that information is available from foreign sources, the failure of the IRS to allow the payment of any outstanding US tax owed at a later date – to match the actual filing deadline from abroad, the failure of the IRS to dedicate sufficient resources to serve those abroad – while demanding compliance, the failure of the IRS to recognize that filings from abroad required more knowledgeable and dedicated IRS assistance – due to the complexity of the extraterritorial requirements, the failure of the IRS to allow common deductions given to those stateside – but denying the equivalent to those abroad, the lack of eligibility for US services (SS, Medicare, etc.) offered to other citizens – but denied those abroad despite taxing them, the failure of the IRS to consider those abroad important enough to dedicate assistance to – while insisting on more burdensome compliance, the IRS tax discrimination against non-US non-resident spouses and children, etc…….. This may not be new at all to ACA members, but to me, after reading the evidence from an actual primary source more than 30 years old completely supports my present conclusion that the US and IRS really has no intention of addressing any of this discrimination and injustice. Clearly the United States is not and does not intend to take the advice of its own “advisory” law and the advice of a then President of the United States. What is the effect of the conduct of the United States Government? I have argued for a long time that the way the U.S. treats its citizens abroad is a human rights violation. We know that President Carter is a supporter of the Universal Declaration of Human Rights. Would he believe that the Obama administration’s treatment of U.S. citizens abroad is a human rights violation? A comprehensive analysis of possible U.S. violations of the Universal Declaration of Human Rights, in relation to U.S. citizens abroad, is at the Isaac Brock Society. Without attempting to duplicate this brilliant and comprehensive analysis, it would be interesting to note the clearest violations of the Universal Declaration in relation to U.S. citizens abroad. I am restricting this to violations that affect U.S. citizens abroad disproportionately. I suggest the following violations. Below each I will include the reason described in the original post by Petros of the Isaac Brock Society. Feel free to add comments. Article 2 forbids the United States to discriminate against people whose wealth exceeds a certain arbitrary limit, marking them as targets for special and discriminatory punitive measures. Taxing ex-citizens of the United States in a manner different then other non-resident aliens of the United States is not equal protection under the law. Banishment of former Americans, treating them with unequal treatment to other citizens of their new country of citizenship, is discriminatory and a clear violation of equal protection. An expatriate who renounces citizenship nevertheless has a right to return under Article 13; this right of return does not obviously still include taking up residence or employment without obtaining the appropriate visa, but it is a right that must be extended to the expatriate to the same degree as to any other citizen of the expatriate’s new country. A Canadian citizen may stay, for example, for six months in the United States without a visa. To forbid a former citizen who is now a Canadian citizen the same length of stay in the United States is a violation of Article 13, which attempts to prevent tyrannical countries from permanently exiling people born in their land. Article 15 treats the right to expatriate as a fundamental right. The Ex Patriot Act seeks to prevent rich citizens from exercising this fundamental right. An American has the right to marry a non-American. Article 16 seeks to protect marriages from arbitrary and unfair treatment. Marriages of American expats are in danger because of extra-territorial taxation. The non-resident alien spouse of an American comes into the danger of excessive fines of the current FBAR regime, as well as unjust extra-territorial taxation. An American who renounces citizenship in order to protect their non-resident alien spouse has the right to do so, and Article 16 would protect that person and their spouse from abuse that may result from expatriation. Expats who move overseas to work have done no wrong and must not be punished by the United States. United States extraterritorial taxation undermines just and favorable remuneration and jeopardizes the well being of the families of US expats. It is demeaning and humiliating to be treated in this manner by a government in a far away land. Rather than supplementing the well-being of expats, the United States seeks to leech off of them, taxing them while providing no useful services to them. US extraterritorial taxation takes no account of the higher cost of living in other countries, including sales taxes for which there is no equivalent in the United States. While a person may seem to make a lot of money in another country, the US has no right to tax them because it does not provide any of the services such as health care, education or other social services that the expat needs to survive in the country of residence. What services to motherhood and childhood does the United States provide to expats? None. So the United States should not take from expats when it does nothing to help them. The Ex Patriot Act is clearly trying to prevent US citizens from exercising their freedoms and rights as provided in this Declaration and would thus be substantive violation of Article 28. The mechanism for complaint is here. FATCA will make it absolutely impossible for U.S. citizens to live abroad. Perhaps the time has come to seek help from the international community – for their benefit and for ours! One wonders what would have happened if Jimmy Carter had been re-elected in 1980. President Carter may or may not see the treatment of Americans abroad as a human rights issue. That said, we know that he is a supporter of human rights in general. If Carter had been re-elected, U.S. citizens abroad might have been valued rather than treated as “tax cheats” to be milked for revenue . The current attitude of the Obama democrats is confirmed in the following comments of Timothy Geithner. Note his reference to Americans abroad paying their “fair share of taxes”. For what? This entry was posted in Citizenship-based taxation, FATCA, Social disadvantages of U.S. citizenship, U.S. freedom, U.S. tax issues and tagged President Carter Universal Declaration of Human Rights on January 25, 2013 by renounceuscitizenship. President Carter is not the only to describe the attack on human rights from the United States. How did this happen? From Facebook to FATCA!